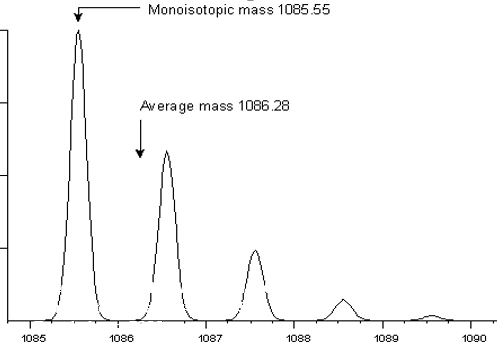 If the mass spectrometer you are working with has sufficient resolution look at the isotopes, a singly charged ion will show isotopic peaks that differ by 1 mass unit, a doubly charged ion will show peaks that differ by 0.5 mass units and so on. This is another way to deduce the charge state of a peak and thus the mass. Which peak do I have to look at when determining the charge based on the isotope distribution? Why would the peaks differ 0.5 mass units (see above)? When looking at the above graph, there is a difference of 1 amu between the different peaks. What do the isotopes have to do with the charge? What does this charge (and isotope distribution) tells us about the peak on which we zoomed in to create the above graph? If you have an ion of mass 100 and charge 2, the m/z ratio (let's exclude the root) will be 100/2=50. If you have isotopes, then you expect to find several peaks for a given fragment. For example, the masses of different isotopes of the same molecule could be like: 100, 102, 105 and 107. In this case the spectrometer will detect four peaks, instead of one, for the same molecule (will look something like this): 100/2, 102/2, 105/2 and 107/2. The charge of all that peaks is the same.. it's only the mass that differs. The page you linked simply makes an example, "singly charged ion will show isotopic peaks that differ by 1" example m=10 z=1 m/z =10, for the isotope m=11 z=1 m/z=11 (difference of 1). If you have a doubly charged ion m=10 z=2 m/z=5 and for the isotope will be 11/2=5.5 (difference of 0.5). So, if you take the spectra of a compound and you see the isotopic peaks having a distance of 0.5 among each other, you are looking at a doubly charged ion, if the distance is 1, it's a singly charged ion. What do the isotopes have to do with the charge? Given that the isotopes peaks are around 1 units far from each other, you can conclude that the ion you are looking at has 1 charge. The last question is not clear to me. I've changed the order of your questions so that the answers follow from one another. The presence of isotopes has no effect on the charge of the molecule. The physiochemical properties of the molecule and how the MS has been setup dictate how molecules acquire charges. This is important as methods which utilise isotopic labelling rely on the presence of isotopes in molecules having no effect on their physiochemical properties. Secondarily, life would become untenable if the incorporation of isotopes altered the properties of proteins (see below). The m/z of the isotope peaks provides information about charge so you use the spacing between isotope peaks. It is important to use the most accurate measurements, which will be the strongest peaks, to calculate the mass difference. There is no need to use the monoisotopic (M) peak which in some cases will not be present. ~ 1.1% of the carbon on the planet is C13 so on average in biological molecules 1.1 out of every 100 carbons will be the C13 isotope. Therefore, as biological molecules get larger C13 will be incorporated more frequently and the chances of measuring the monoisotopic peak reduces. We know that the mass for the isotope is ~1 so z must equal 1 when the isotope peaks have a difference of 1 m/z. Why would the peaks differ 0.5 mass units(see above)? Let's assume we're working with the same molecule as above (M = 1084.543) but it is doubly charged. In this instance it will have an m/z = 543.778 and the first isotope peak (M+1) will be measured at 544.278 m/z. We know that m = 1 when a single isotope is present so the difference of 0.5 m/z => 1/0.5 = 2. The charge (z) is 2. Note that every charge adds a proton at 1.007276 mass units to the monoisotopic mass of the charged molecule. However, when we talk about the monoisotopic mass of the molecule we don't want to include protons. That is why M = 1084.543 rather than the 1085.55 m/z (and mass) of the singly-charged molecule that was shown in the image above. Not the answer you're looking for? Browse other questions tagged proteins mass-spectrometry mass-spec proteomics or ask your own question. How to generate simulated mass-spectrometry data for phosphorylated proteins? Are both B and Y ions required to determine the sequence of a protein by mass spectrometry?